Working with Muriel for the pas 4 years has been a great experience! From managing the complete remodel of our appartement to the everyday tasks (scheduling plumbers, arranging for cleanings, delivering keys, etc.) Muriel enables us to rent out an appartment that is 6 000 miles away from our home with confidence that it is always well taken care of. She's always cool, calm and collected and handles any challenge without drama. Muriel has made owning a home in a foreign country a little less foreign. We could not have done it without her. �I first met Muriel in villefranche when looking over a potential new property and needed some idea of the cost of renovation. I had been looking for a property in the old town of villefranche with some outside space. Muriel helped me to source a property that had fantastic potential but needed much work. From that moment on the whole process of purchasing the property and subsequent renovation has been seemless. I had previously had a bad experience of agents in the area to the point of feeling quite cheeted. Muriel has introduced first class tradesman from Italy and France and has saved me a lot of money in the meantime. She has managed the entire project from start to finish for a reasonable fee.Normally I would not undertake such a product remotely from another country especially as I am not fluent in french but I could not recommend more the service Muriel has provided. She has a great knowledge of the area and the whole planning process and knows all the right people�. This is a lovely apartment which became our home for 9 days. The views are spectacular, the furnishings very comfortable and the kitchen is a dream! The location is very convenient for travel up and down the Cote D'azur and the village of Villefranche couldn't be more inviting. It has everything one might need: convenience stores, many fine restaurants, bakeries, shopping, and a great base for sightseeing adventures. We've stayed in other apartments in France and this one was, by far, superior to others. Thank you to Erin, who gave us all the information we needed to make our holiday so successful, and to the owners, who have made such thoughtful touches in how they have set up this apt. We would absolutely return." Positive Rating Robert Owen , Miami, Florida We had a wonderful 2 week stay in VilleFranche Sur Mer and just loved the apartment. We were able to explore the surrounding area, and by the end of our stay were felt as if it were our home. The village was so nice and all the neighbors and local townspeople were wonderful. It was a vacation of a lifetime. Hope to return someday. My husband and I spent a wonderful week at this lovely Villefranche-sur-Mer apartment. For the two of us the apartment was very spacious (also big enough for 4-6 people), it has a great kitchen and above all, the view from the apartment overlooking Villefranche-sur-Mer and the beautiful blue mediterranean sea was fantastic. We truly loved sitting on the little balcony every morning for breakfast and at dusk for sunsets! Villefranche-sur-Mer is one of the prettiest villages along the Cote d"Azur and has very nice shops and restaurants. Also there are so many opportunities for day trips from Villefranche to Nice and Monaco, to the perched villages or even to Italy. You should spend at least a week there! Muriel, the manager at Villefranche, as well as Erin who handles the initial booking have been extremely helpful and friendly. All in all, the apartment can be highly recommended and we will definitely return! Recommended for: Girls getaway, tourists without a car, sightseeing, families with young children, romantic getaway. "A wonderful unforgetable visit to Villefranche" This apartment in Villefranche has all of the amenities that make for a great holiday. It was newly renovated with a fully equipped kitchen. Spotlessly clean and tastefully decorated. Having breakfast on the patio was an experience that I will always remember - the panorama of the Mediteranean with the Villefranche harbor in the foreground is a wonderful memory. The apartment is well situated, within walking distance of the town and beach and convenient to bus and train services to Nice and Monte Carlo. I hope to return and will most certainly rent this apartment again. "The perfect retreat, with a breathtaking Vista ." The moment we entered the well kept gardens, and turned the key to the apartment we felt at home. The interior of apartment Leopold II was tasteful and elegant, every room had a fresh and welcoming feel and provided ample accommodation for me and my three adult companions. The pinnacle of our day was throwing the colonial shutters open and unwinding on the Terrace with a cold glass of Cava after a relaxing day on the local beach in Villefranche, and bathing in the evening sun absorbing the beautiful views of Cap Ferrat and the glistening cote d'azur. Our days were filled with adventure and relaxation, the apartment is quite conveniently located just a short stroll from a bus stop that services the center of Nice and continues on to Monaco Ville. The shopping in Nice was out of this world, from high end boutiques to antiques days could be spent browsing. The old town also provided unlimited choice in regards to eating out, all fabulous establishments. Night life varies from authentic in Nice to Glitz in Monaco. Me friends and I had a particular soft spot for near-by Monaco, the cafe culture was amazing the Japaneese gardens were enchanting and the glamour of the marina and Casino were just unsurpassed! Keeping it local Villefranche is a beautiful quaint and intriguing town, the restaurant's were fabulous and provided top quality meals at a reasonable price, elegant bars line the promenade in the town where we sipped cocktails and watched the local fishermen land their daily catch. The beach was located at the end of the promenade, which accommodated locals and sun seekers alike, it never felt crowded, and the water was always crystal clear and pleasantly refreshing, much like our holiday in this wonderful apartment. I would absolutely recommend staying in apartment Leopold II as the residence really did compliment and enhance it's infamous location . Will defiantly return to this beautiful apartment ,we found a genuine hidden gem.! 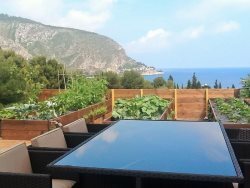 "Excellent apartment Holiday in Villefranche" Recently our family holidayed for two weeks at the above apartment. We had a most enjoyable time and the apartment was excellent. It was spacious, comfortable and the furnishings were quite luxurious. From its balcony we had a view to die for, looking out over the bay of Villefranche framed as it is by a typical Riviera landscape. Cruise ships and pleasure craft in the bay provided a very pleasant backdrop for post dinner drinks on the balcony. The local sandy beach is a five minute walk along a pedestrian-only pathway and there are a range of coastal walking routes nearby just waiting to be explored. Villefranche has many good restaurants and we had access to a range of water sport activities in the harbour. It proved an excellent base for exploring the surrounding area. In addition to Nice we visited Monte Carlo, Antibes, Cannes and Grasse which is famous for its perfumes. We also did a day trip to Genoa to get a flavour of Italy. We got to all of these places by public transport and there are excellent bus and rail connections within walking distance of the apartment. In short we had a superb holiday and a return visit early in 2012 is already planned. "Unforgetable vacation" The place was amazing, the view from the balcony is great, the kitchen and the bathroom are fully equipped and the rooms are also very comfortable. I could only recommend this place to anyone. "Don't Think Twice!" Most reviews give similar accounts...after all, we are referencing the same places, but the short of it is...This apartment is fantastic... Stay here and enjoy it while you can! We spent a wonderful week in this fabulous, updated apartment during early September, 2011. Muriel is the perfect host... extremely thoughtful, sincere, knowledgeable, and readily available if needed. As for the apartment in general, we found it lacking in nothing... all the comforts and conveniences of home were available, including a wonderfully thoughtful and useful welcome basket, replete with wine to start our journey in Villefranche. As two couples we particularly enjoyed the two separate and complete bathrooms. Wifi and the phone service worked splendidly and gave us a sense of security and relief maintaining a connection with family back home when necessary. The television was wonderful but never used since we were too busy taking in all of Villefranche! The location is great being close to all conveniences, sights, and amenities, including train access...even the beach is but a very pleasant stroll away! A wonderful variety of restaurants are within a short walk. Perhaps the best restaurant of all, one of combined value and quality, is literally across the walkway. Don't miss it! Probably the single most important impression we have in retrospect is that we truly felt at home! The locals are friendly and helpful, and we spoke with people that have returned on numerous occasions for the beauty, the warmth and the charm of Villefranche sur Mer. We truly hated to leave and continue to talk about an encore! "Luxurious Haven in the heart of old town Villefranche" My Family - my wife , myself and two grown up children (24 + 26) had a blast at Muriels place. Very comfortable apartment -ideal for four adults. Centrally located in the heart of old town Villefranche... amongst the narrow cobbled streets with superb cafes and restaurants. A short stroll to the harbour and to the beach. Walk to the train station for regular service to Nice (and wetsward) and to Monaco (eastward). Would have loved to stay longer than the four great days we had there ... will book earlier next time. "Perfection in Villefrance" Perfect ! The apartment was 5 star ! Tastefully furnished with every modern convenience, broadband, satellite TV, dvd player, dishwasher. We stayed for one month and the owner had thought of everything to make you feel at home. Its just a 2 minutes walk to the sea front with numerous restaurants to choose from but if you want to cook at home the local shops are on your door step and the kitchen has every appliance. Local transport is within easy reach but the old town has limited parking but I believe thats the south of France in general. "Beautiful place, lovely view." New, beautiful house was in good condition and furnished with good taste. We enjoyed lovely garden and pool. Welcome package was suprice. "What a wonderful view!" Superb accommodation, very comfortable. We enjoyed all our meals on the balcony taking in the view. Loved the balcony garden. Wonderful area to explore, Eze, Monaco,St Tropez,Grasse,San Remo. There is a well stocked supermarche at the marina,minutes away, with the tempting smell of freshly baked bread. Great holiday! "fabulous apartment right on the beach" we had a wonderful stay. the apartment was beyond our expactations. the views from the terrace are magnificent and calm. it is high standard apartment and is part of high standard complex. muriel service was very friendly and all process of check in /out was easy. she also provided a lot of information and a welcome supplies. "Great location suitable for a couple in a beautiful area" Checking in was very friendly and all maintenance issues were dealt with efficiently by pleasant locals. The welcome basket was a nice touch and generous. The cleaning was good and the kitchen well equipped. The flat was also warm at a chilly time of year. Check out was efficient too as was the whole booking procedure. The flat is quiet and being by the ocean and so near to Beaulieu etc was great as was having the walk up to Eze so close at hand for those who want to wear off the croissant and tarte tatin calories. I would also recommend Riviera Rentals for the efficient service. "Relaxe & view" Very nice appartment,well furnished & equiped. Nice place & view. Not far from every services but must have a car. "Wonderful experience" I visited with my sisters-in-law and we had a super time. The accommodation was terrific, spotless and very comfortable, couldn't have been better. The town is beautiful, and so central for travelling around the area. I can't wait to come back! "Fabulous" The accomodation was centrally located and bright, airy, spotless and just perfect. The village was great, the people friendly, the restaurants great value and overall i could not rate my stay negatively. There are many steps and cobblestones, also about 50 steps in the apartment complex up to the apartment so i would not recommend it for people with walking difficulties but that would be the only negative comment. The weather was mild for the end of november and sunny on the last day. We visited the village of Es in the mountains by bus and had a fabulous wander around the walled village and we visited Monte Carlo by short train ride and spent a lovely afternoon wandering around seeing the castle, marina, casino and other sights. I would highly rate both the accomodation for its accessibility to all these spots and on its own for its location and its comfort and cleanliness. "Wonderful french getaway" My daughter and I spent 6 nights here this past July 2011. The apartment was fantastic, even better then we expected. It was so nice to have a real hombase after traveling in hotels. We especially appreciated all of the thoughtful touches, like the beach mats and umbrellas. The bed was the most comfortable of our 5 week trip. The views from every window were fantastic, just like the pictures but better! The kitchen was well stocked with utensils and dishes which made cooking a breeze. The instruction book for the apartment was very well done with lots of pictures and arrows, following the steps I even figured out the washer and dryer! The apartment is in a good location, grocery and bakery nearby and the main part of old town is a short walk down hill (the only downside is the walk back up hill - a good way to burn off those dinner calories!). There are many resturaunts to choose from, Le Serre was our favorite. The bus stop is very close and from there it is an easy bus ride to Nice or Monaco. I would not hesitate to stay here again, I hope I do one day! "Great views!" Stayed for a week in October. The apartment was very nice. The kitchen was gourmet quality. Very close to all local sights. Easy parking (for a small town in France) The manager was very helpful. Would go back again! Not our first trip to this region, but one of the most spectacul To stay in te old town of Villefranche sur mer, with its small cobbled streets and hidden charm was an absolute joy ! .. The appartment we stayed in was just a couple of minutes from the bay of Villefranche, and never more than a couple of minutes from a restaurant, bar, or local amenities. It was just what we wanted, clean well decorated and comfortable. Muriel was excellent, and the whole experience was a joy ... From the morning run and dip in the sea, to morning coffee and a read of the English newspapers, to the sightseeing locally to the evening meal the whole thing was a huge pleasure and one we will go back and replicate i`m sure .. In our excitement to find the appartment we failed to follow Muriels detailed appartment finder including google earth images .. Parking in Villefranche can be difficult so next time we might rely on the local bus & train service .. We ended up parking round in the port of Villefranche which was convenient and free .. the walk back from there to the town is 5 minutes or so around the sea wall .. Be sure to visit the port restaurant `Joyeuse Boleyn` and have the catch of the day ! .. and for a special occasion " La Bourride" restaurant in Cagnes Sur Mer .. Very expensive but excellent food and service .. If you can manage endless steps and gradiants and enjoy the French way of life a stay in Villefranche will be an absolute joy ! .. and booking with Muriel will ensure i`m sure that there are no last minute problems.. from the communication before and during our stay to the welcome pack of essentials .. the whole thing was fabulous ! Not our first trip to this region, but one of the most spectacul Left on Apr 24, 2014 for a stay in Apr 2014 To stay in te old town of Villefranche sur mer, with its small cobbled streets and hidden charm was an absolute joy ! .. The appartment we stayed in was just a couple of minutes from the bay of Villefranche, and never more than a couple of minutes from a restaurant, bar, or local amenities. It was just what we wanted, clean well decorated and comfortable. Muriel was excellent, and the whole experience was a joy ... From the morning run and dip in the sea, to morning coffee and a read of the English newspapers, to the sightseeing locally to the evening meal the whole thing was a huge pleasure and one we will go back and replicate i`m sure .. In our excitement to find the appartment we failed to follow Muriels detailed appartment finder including google earth images .. Parking in Villefranche can be difficult so next time we might rely on the local bus & train service .. We ended up parking round in the port of Villefranche which was convenient and free .. the walk back from there to the town is 5 minutes or so around the sea wall .. Be sure to visit the port restaurant `Joyeuse Boleyn` and have the catch of the day ! .. and for a special occasion " La Bourride" restaurant in Cagnes Sur Mer .. Very expensive but excellent food and service .. If you can manage endless steps and gradiants and enjoy the French way of life a stay in Villefranche will be an absolute joy ! .. and booking with Muriel will ensure i`m sure that there are no last minute problems.. from the communication before and during our stay to the welcome pack of essentials .. the whole thing was fabulous ! Wonderful place to relax in a great environment For the 4th time we have enjoyed the amenities of this home. The house has everything you need and you can only just feel good. The house is very clean and the fridge is already filled with drinks when you arrive. The house is situated in a very quiet location and you can walk still quite fast in the village of St. Jean. Due to the very large garden with swimming pool and outdoor terrace, you have everything you need for recreation. Although there are nice restaurants in Villefranche, Beaulieu and St Jean of course, you can actually nowhere so romantic and idyllic eat like on the private terrace overlooking the sea. This location is a little piece of heaven! My daughter and I enjoyed this apartment very much! The service and niceties that Muriel Berdat supplied made all the difference. You don't usually find that your place comes with a welcoming basket full of treats, and your refrigerator has cool drinks already inside. We enjoyed having the two bedrooms, and everything was sparkling clean and inviting. It is a homey atmosphere full of Provence charm. The furniture is comfortable and functional. We did indeed walk down the hill and across the street to spend time on the beach and enjoy the Mediterranean Sea more than once! We liked our neighborhood on the hill, and wanted to drink in the view of the beautiful scenery all around us every moment. Being close to Nice and close to Monaco is a great location. All the small towns in between are also beautiful to visit. Be sure to take in the Nice flower market, and drive up in the hills to visit the town of Biot where glass blowing galleries and artistic shops are beguiling! Don't miss touring a Parfumerie either. We liked best that Muriel Berdat is by far the most attentive agent we have ever come across! Just a small thing that could be improved upon is the patio area, which needed a little attention. Great Family Location 1 people found this review helpful We are a family of grandparents, parents and two lively boys (5 and 7). The place was perfect for us (one room has bunk beds for the kids). The interior is very spacious and the exterior has a large veranda with two sets of tables and gas and charcoal grills, and a very spacious yard, viewing deck, and a terrific pool/jacuzzi with a retractable 1-meter high cover (so one can still use the pool on windy/cool days). The rental is on the ground floor and the wonderful owner lives above. He was available to warm up the pool/jacuzzi but we had complete privacy. He was also kind and helpful. He even gave us a ride to the SuperU in Beaulieu, and brought by chocolate Easter baskets for the boys. The location is superb: short walk down the hill to the commercial are of Saint Jean (markets, bakeries, wine stores, many excellent restaurants) and wonderful walks around the Cap. We were very sorry to leave. Muriel was also extremely helpful with the rental arrangements and descriptions of what to do along the Cote d'Azur. "nice one..very nice one.!!!" Excellent accomodation in excellent conditions (..it's new one..) in villefranche "downtown". Near resturants bars and all the shops and obviously near the free beach. I suggest for a great vacation in cot d'azur..!! "We had a wonderful time staying at this apartment!" Muriel was great to work with. She answered all questions and was so friendly. We loved the location. It is a smaller town, but a train ride away from everything. There were only 2 of us so we enjoyed the space of the apartment. Would stay again for sure!